Hand held GPS receiver with large display, integrated world and Europe/Africa map plus serial interface. The GARMIN eMap is easy to use, supports multiple languages, has a large, easy to read display, an extremely sensitive antenna, an integrated world map (overview) plus a base map of Europe, Africa and the near East. There is a slot for an additional memory module to store even more detailed information, such as local roads, restaurants and points of interest. eMap provides navigation information outdoors, in a car, in a train or even in an airplane (see MapSource examples). The built-in serial interface supports data exchange with a PC. Slot for additional memory module to download additional, even more detailed maps with roads, crossings and addresses of restaurants, public buildings, points of interest etc. from a PC. Extended search function for points of interest, addresses and intersections, if there is a MapSource map available in memory. These maps require an optional memory module, a Windows PC plus a connection cable and are available as options, see MapSource MetroGuide. 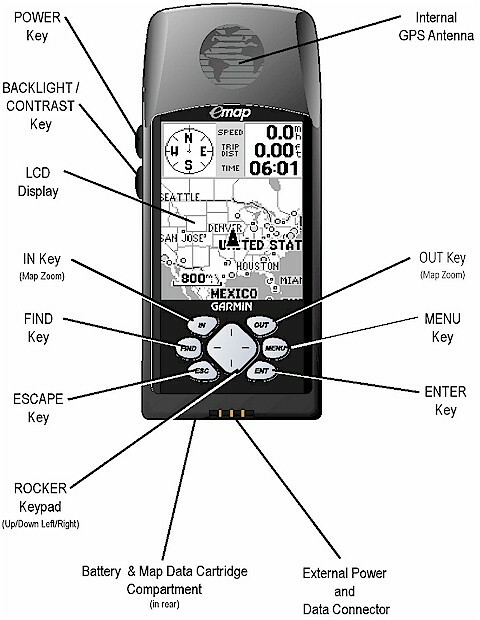 GARMIN eMap: This model has been discontinued; however, you can still order options for the eMap. All options for the GARMIN eMap in detail. Here we provide additional documentation and software updates related to the eMap.